I snuck out of work today mid-afternoon to get a much needed run in, especially after last night's glutinous participation at the Cumberland Fair. The extra few pounds and cholesterol points I added were worth the fun Riley had. Despite the nutritional misdirection of last night, the run today was great. I hit the LLB trails once more and added a little loop to the typical 4+ miler we have done the last couple times... and I didn't get lost! The ground was still a little wet from last night's showers so I took out my wear tester shoes to check them out and once more I confirmed that these are shoes I would never recommend anyone ever buying. The run itself was great. 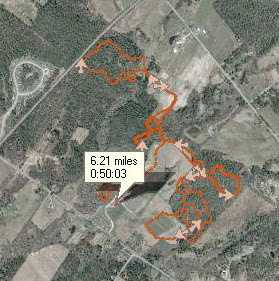 I ran just under 5.25 miles at a 8:00/mile pace with an average HR of 156 (due to some of the nice hills on the course). This run was just what I needed and it served me well. I received a call from my buddy James today regarding a friend of his who was just diagnosed with the same cancer I had. Her situation was the same as mine in that the cancer has progressed so far that she started chemo immediately after diagnosis without any time of reflection. This is tought but for the better. Cancer is a life changing thing and her life will be so enriched by the experience. My prayers go out to her and I ask you all to do the same. Her name is Candace. James asked me if I would be willing to talk to her and give her some support. This is the privilege and duty of cancer survivors. Hopefully I can help. On a separate note, I am currently working on a new blog which will not only focus on me as a runner but on me as a cancer survivor and dad. These are the two things that truly propel me forward daily so I feel like I should incorporate them more. The Ultraflash thing just isn't me. It's time for a different costume. I hope to introduce the new blog with my race report...which I promise is coming. Below is a brilliant Onion News Network report on the 80-year African American boycott of L.L.Bean. Enjoy. Work has been tough lately and kept me chained to my desk. Not ideal but reality. Today was particularly difficult and I really needed a run so after picking up the kids and arriving home, Kelly was kind enough to let me go run while she cooked. She's a saint as trying to prepare dinner with two highly energetic and mobile toddlers is difficult to say the least. She managed and I got my run in. The temps were in the mid-60s with clear skies and a beautiful full moon. I went out fast with a moderate pace at 7:30/mile which progressed to a couple 6:40s and 6:50s for an average pace of 6:50 over the 5.5 miles I covered. I would be lying if I said this felt good as I found it somewhat taxing tackling the hills the last couple miles. It was nice though to log some miles. Tomorrow I hope to post my VT race report. I know you all are biting your nails in anticipation (joke) but it's coming! Today I just couldn't get enough of the trails. I met Blaine and his buddy, Andy, as well as a couple of Blaine's fast racing friends, Josh and Chris, at Bradbury at 6 AM for a tour of the Bradbury Bruiser course. Friday night I downloaded the course onto my Forerunner 305 to avoid running off course this morning but to no avail. I did download the course and accessed it correctly this morning but in the excitement at the start of the run I forgot to push start. Daggon' it. So we proceeded to run off course on the "O"trail due to leaf cover, which was much worse than last weekend. There were a couple times where we had to refer to the map (at almost every post) and even correct ourselves, but the trails out there are beginning to feel like my home turf and will be easier to navigate each successive weekend I am out there. I did fall a couple times due to lack of sleep and beer consumption the night before, but all in all it was a great time. There was a cool sighting of some member of the Partridge family, of the bird variety, in form of what I am guessing were a couple Ruffed Grouses. They could also have been Ring-Necked Pheasants (the one I saw would have been a male), but my guess is the Grouse. They displayed an awesome fast-twitch response when we flushed them, leaving leaves dancing on our shoes from their takeoff. Also, as we were running the "O" trail we saw wildlife of another sort in the first wave of mountain bikers come through right after the start of the 12-hour bike race there today that just finished a half hour ago as of this writing. Crazy. I can understand running for 24 but not biking 12. Those guys must be nuts. 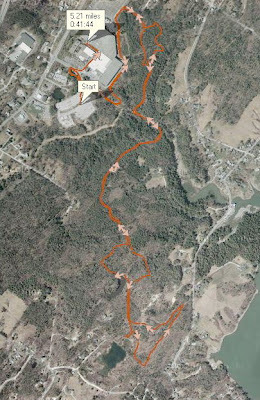 Due to the confusion I suffered on the "O" trail due to the ground cover, we ended up doubling back on the trail to the finish, running an estimated 10.5 miles in 1:45. Next week we will be success ful in running the entire course. After finishing up at Bradbury, I headed off to Pineland for the Gray-New Gloucester Boosters 5K/10K (pictured right). There was a good showing in the way of 125 or so participants, including my wife and two kids in the jogging stroller. The Trail Monsters were there (Ian, Emma, and James) and they posted impressive results. Kelly was a little late in arriving so the gun had gone off before we ever even had the kids strapped it the jogger, which worked out well since I didn't want to mingle with the crowd with the terribly large contraption I was pushing. At any rate, we made it around the 5K course, which consisted of the Campus loop, in 34 minutes, a 10:42 pace. This was good enough however to win Kelly a loaf of Foley's bread for second in her age group. Emma, Ian, and James ran the 10K, which netted Emma and James two of the most wickedly sinful pies these eyes have ever seen. Enjoy guys! Quinn and Riley had a great time in the jogger and it was a great day of running. This is what it's all about! Tomorrow I am off from running and we are heading up north to enjoy the MOFGA Common Ground Fair. Plus, my knees are aching a little from today's run, possibly due to having to lean into the double jogger to get it up the nasty hills of Pineland's Campus Loop. Also, here is a Fun Find of the day. For those of us who are contemplating running the Massanutten Mountain Trail 100 if we aren't drawn in the Western States Lottery, this is surely to delight. Check out the DVD entitled "Massanutten: 100 Miles, Two Runners". There are clips on last year's MMT on this site, and you can order the DVD and get free shipping. Nothing new to report here. I have been slave to the desk and "the man" for the past couple days. Work has been a cruel mistress and has kept me chained to my desk for inhumane periods of time today and yesterday. 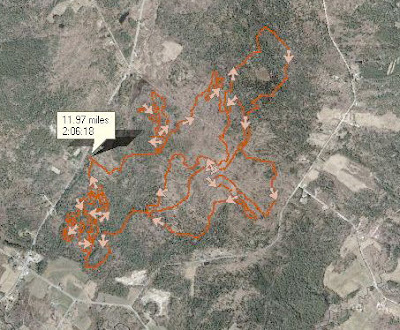 I at least know I will get some good, fun miles in on Saturday at Bradbury and then at Pineland for a double. We'll see. Good news is that I finally found some time to finish up my race report. It will hopefully be published on the Maine Multisports website soon. If I find time I would like to post it here with some pictures from the day. Maybe this weekend. Later. easy, running just over 4.25 miles at a 9:00 pace. My buddy Chuck Hazzard checked out the trails Sunday and got a little mixed up, which is quite easy to do out there. Regardless, lost or not, it's just good to be able to get out and run. Amen. Tonight I headed over to meet the Trail Monsters at Twin Brook. It has been a few weeks since I have met up with the crew and it was good to run with them again. The temps were perfect for a nice hard run. The usual suspects Ian, Blaine, Erik and Shawna (sic?) were there, alongwith one of Blaine's running buddies, Dave, Tiki Humphries, Carol (a neighbor), and another woman whose name I did not catch. The group quickly split up according to pace and I ended up running with Ian, Blaine, and Dave. Ian and I spent a good amount of time talking about the upcoming Bruiser race, now included on the MTC website. The pace progressively sped up for each mile of the 10K, starting at a pedestrian 8:56 with the last mile at 7:30, not bad on these trails. In addition, the last two-tenths found the four of us "racing". Trying to keep up with Blaine left me feeling like I was have an out of body experience. I was definitely out of my comfort zone, but it felt good to open up my hips. Good stuff. The 10K run took 50 minutes with an average pace of 8:00 and an average HR of 152. I talked with Blaine and it looks like we will be meeting out at Bradbury at 6 AM Saturday morning. The 12 hour Mountain Bike race starts at 8 AM so we want to make sure we are off the course when the race starts. Then I may head over to do the Pineland 10K at 9 AM. Hope to see some of you there. Yesterday I successfully navigated the Bradbury Bruiser 12-Mile race course. There were of course a couple head scratching moments, despite the excellent directions and map courtesy of Ian. I arrived for the run at 7 AM and was greeted by Tom Tero and Jim Gott, both L.L.Bean cronies of mine and fellow runners. Also there was a friend of James's, whose name I can not remember. My aplogies. James's friend is planning to run his first half marathon at Maine in a few weeks and then I believe he is following that up with the BB. Good on to him. James arrived shortly in the veggie car with donned orange lensed glasses. Good times were in store. We headed out on the trails in a light drizzle and low 60s. Perfect for a run. The trails were in great condition, despite the rain the previous night. Everyone was in good spirits as we set out. There were a couple runners with us who were new to trail running, so the BB course is a perfect introduction. After a couple miles when we hit the Ragan trail we decided that the paces were too different to try and keep the group together. Jim, Tom and myself split off from James and his buddy and proceeded up the Ragan trail in search of Ginn. The weather continued to be perfect as the expected heavy rains held off. As I said before, the trails were in great condition, likely having just been groomed in anticipation of this coming weekend's 12-hour mountain bike race. The only issue I saw was on the exciting "O" trail. The leaves had been forced from the trees the last couple days due to the rain and winds and obscured the trail heavily in spots. I ran off course a couple times (minor misteps) and had to be corrected by Tom, who is a seasoned Bradbury mountain biker. I think we will have to have a team of leaf rakers out at Bradbury the day before the Bruiser to make sure the trails are clear. Yuck. In the end we all survived, with the exception of whatever animal Tom had hit on his way to Bradbury that morning which had proceeded to soak the parking lot in the stench of death. The end tally was pretty much right on 12 miles and it took us a bit over 2 hours to run it. My guess is that the race day average will be somewhere in the 2:15 - 2:30 range. Just a big guess, and only race day will tell. Today I was off from running as I fell victim to domestic duties. I mowed and spread the mulch that has been sitting in my side yard since early July (sacrificed for the VT 100 and then forgotten). I also fixed my dead dryer and witnessed the mysterious resurrection of my malfunctioning dishwasher. Oh yeah, I spent some great time chasing my two kids. A perfect, productive weekend. I will be back on the roads of Freeport tomorrow. If anyone is interested (Chuck?) 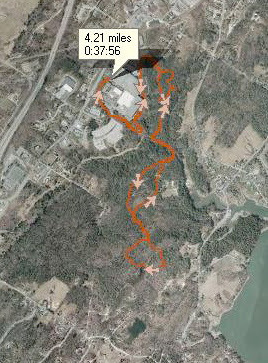 in running the Freeport/L.L.Bean trails at lunch, let me know. I am now off to do a final read through of my VT 100 race report. Hopefully I can get that thing off my list of to dos in the next day! First I have to send a shout out to my boys Jamie and Blaine. Why? Well, Jamie, in addition to being an energizer bunny runner is a published author. I just sat down to a cup of coffee and the latest Marathon & Beyond to read Jamie's article on his first marathon experience at MDI. If you don't already subscribe to this magazine, do so, and in the meantime run out to Borders or Barnes and Nobles and pick up a copy. Great job Jamie and congratulations! Why Blaine? Well, he ran a fantastic race at the Pisgah 50K September 9th finishing in 4:27 and 5th place overall. Congratulations to Blaine on a terrific first ultramarathon! I took it easy today running 7:30/pace average over 5.5 miles of South Freeport's finest asphalt. Tomorrow I am heading out to run wicked windy and wet Bradbury Bruiser course with a couple of my L.L.Bean posse members who have pledged to run the race. Should be a good time taking some virgins out on the course. Also planning to run is my homey James Demer of VT 100 fame and a peep of his. Goin' to be a good time! Today I was fortunate enough to escape the confines of my desk at lunch and enjoy the nice trails that L.L.Bean maintains behind our office. There are miles of trails that are kept well. In fact, I ran into a number of fellow employees and locals out there running. What a treat. I'm back...both to Maine and to running. Vacation served as a forced break from running. It was nice to spend the mornings waking with my family and saved me from dehydration in the hot, humid weather of VA. I really don't know how I ever ran down there when I lived there. Maybe that is why I never got serious about running until moving to Maine. I did get a couple runs in during our stay in Williamsburg. Kelly and I took the kids out both mornings we were there in the jogger for a little colonial running tour. It was very cool running through the streets of the very cool living history museum that is the streets of Williamsburg in the early morning. The only people about town at that time are the workers in their colonial garb on their way to their jobs as carriage driver, ox cart driver, blacksmith, or wheelwright. Very cool. With the heat and the kids, we got in a couple runs in the 3.5 mile range. Just perfect to get the day going. Since being back I have run a couple days. Yesterday I ran a 6.2 mile course around Freeport in a low 7:00s pace and today I knocked out 5.5 with Ethan (cut off at the 4 mile mark to add some distance and speed), Tom, and Jim, all of whom are running the Bradbury Bruiser 12-miler. 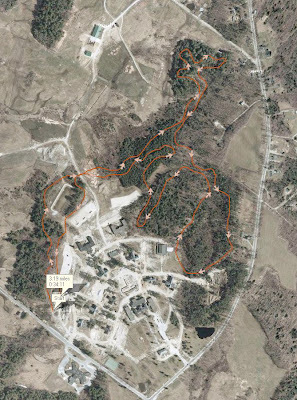 Speaking of which, I am heading out at 7 AM Saturday morning to run the course with a couple others who are new to the trails and who are running the race. Let me know if any of you who are reading this want to join us. The past two weeks have seen me develop a terrible running habit...a habit of not running. Last week work took precedence and this week it appears that vacation is going to furlough me a bit more. No worries because we can all use some time off now and then. Friday I was able to sneak in a run with a buddy from work, Jim Gott, who is in training for the Bradbury Bruiser 12 Mile Trail Race. He's never done a technical trail race, so this race will be his introduction, as we hope it will be for many others. I planned my run to end with a pass by the L.L.Bean store to pick up a monogram order I had left for my new niece. That was the last time my running shoes have seen pavement. Tomorrow we are heading to Williamsburg for a few days to visit Busch Gardens and to tour Colonial Williamsburg and Jamestown (400th Anniversary). We love visiting this place and would recommend it to anyone looking for a fun and different vacation. Kelly and I did pack our double jogger and plan on getting in some "historic" runs while visiting. I also love running in new places like this. Running through neat places like this during the early morning provides a unique view and perspective while allowing you to cover lots of area in a short amount of time, all while burning the calories you will likely be adding in abundance later in the day. One of my favorite vacation runs was during a visit to Savannah, GA in early spring last year. I was able to run through all twenty-one of Savannah's existing squares. If you ever make it down there please give yourself the pleasure of running these things. Too cool. Alright, I'm off. To my friends in the north, enjoy the cool running weather. I look forward to running with you soon.